Pep Guardiola’s Manchester City continued their perfect start to the Champions League this evening, as the Premier League leaders beat Serie A table toppers Napoli 2-1 at the Etihad Stadium. Man City began the scoring in the ninth minute, after David Silva was played in down the left hand side before cutting the ball back to Kyle Walker, who saw his shot blocked, however his England teammate Raheem Sterling was on hand to score the rebound to give the home side the perfect start. 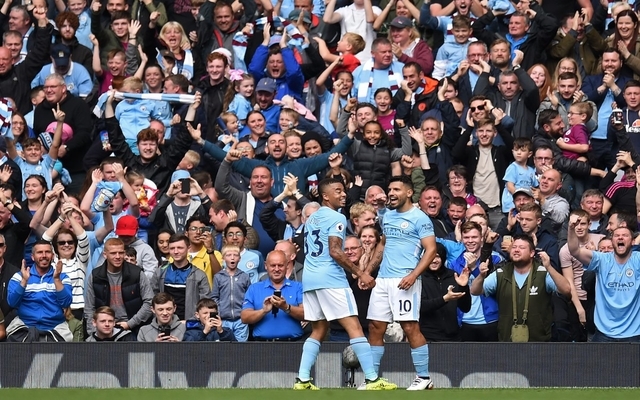 The home side then continued the scoring just four minutes later, as a failed ball over the top from Sterling was picked up by Kevin De Bruyne, whose brilliant cross to Gabriel Jesus was tapped home by the Brazilian to double City’s lead. The away side then had the chance to half the deficit in the 38th minute, after City gave away a penalty, however Belgian forward Dries Mertens saw his spot kick excellently saved by Ederson in the Citizens goal. Napoli did eventually claw a goal back 17 minutes from time, as midfielder Amadou Diawara scored the away side’s second spot kick of the match, after Algerian international Faouzi Ghoulam was tripped up by Fernandinho just inside the City penalty area. Six minutes prior to their goal, Napoli had the best chance of the match, as Marek Hamsik was left with an open goal after Ederson closed down Mertens, however John Stones was on hand to make a fantastic goal-saving block to deny the Slovakian. For City, this win will be a big confidence booster, as Maurizio Sarri’s side are one of the most exciting teams in world football, and are one of the most difficult sides to play against. For Napoli, the result will definitely be a disappointing one, as the Italian side had more than enough chances to find an equaliser.